A clever idea for saving labels from wine bottles. 24 per pack. Simply adhere the Lifter to the label on the bottle, then peel the wine label (stuck to the Label Lifter) off. 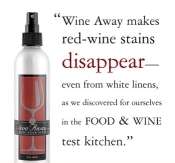 A remarkable red wine stain remover formulated to remove most red wine stains from carpet and fabric. 60 ml (2 fl Oz) pack. Made from food grade ABS and silicone gum. 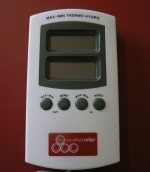 Simple pump action keeps wine well-sealed after opening. Built-in pump so you no longer have to search for both the pump AND stopper. Give every glass or guest a character. With Party People Glass Markers you will always have 12 extra guests at your party. 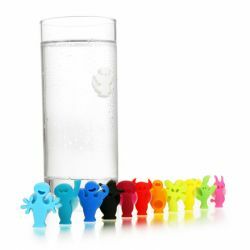 Once the suction cap has been moistened, the unique figures attach themselves to any smooth surface. Give every guest a character by sticking one of the “Party People” to his or her glass.